I know it’s Tuesday and all, but this is my Meal Prep Monday post…since I was too pooped after spending half of the day in my kitchen yesterday. I just didnt have it in me to actually sit down and blog about it after. For clarification – it didn’t take me half of a day to meal prep! I was experimenting with some other recipes that will be making an appearance very soon 🙂 Experimenting + meal prepping + (my favorite!) washing dishes + doing laundry at the same time = very long day. Ugh…seriously, why can I not just have a dishwasher and washer/dryer in my own apartment in San Francisco? I’m going to have to move after my lease is up with this place. I hate washing dishes. Oh, right, we’re here about the food! Not the dishes. So I decided to mix things up a bit this week with my meal prep. I’ve been repeating a lot of the same food combos lately so I figured, why not add some purple in there? And I did. 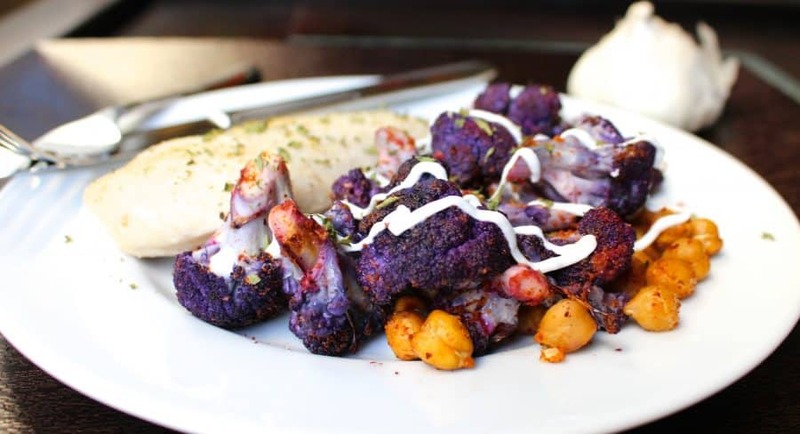 With some purple cauliflower – why is it purple you may ask? I have no idea, but Wikipedia tells me it has antioxidants. It tastes exactly the same as white cauliflower. Keep scrolling to the bottom for the rest of my meal prep ideas and nutrition info! 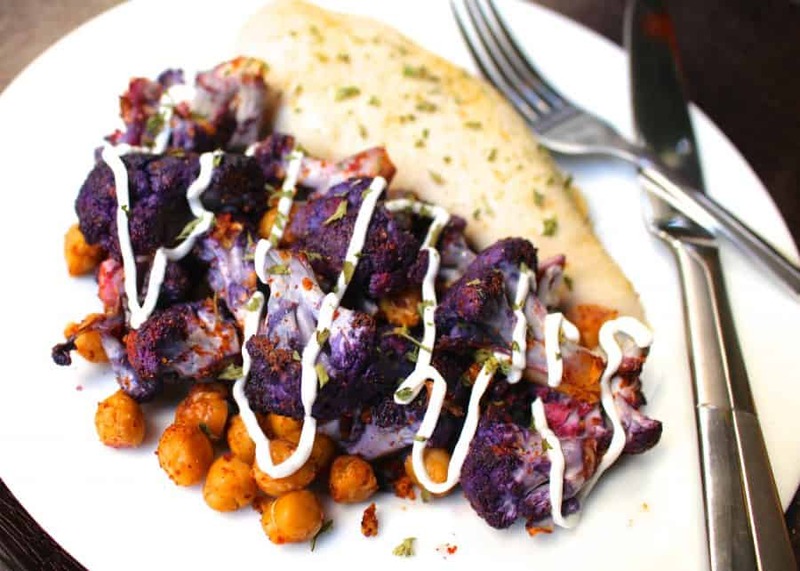 In a large bowl, toss all ingredients together until cauliflower and chickpeas are evenly coated. 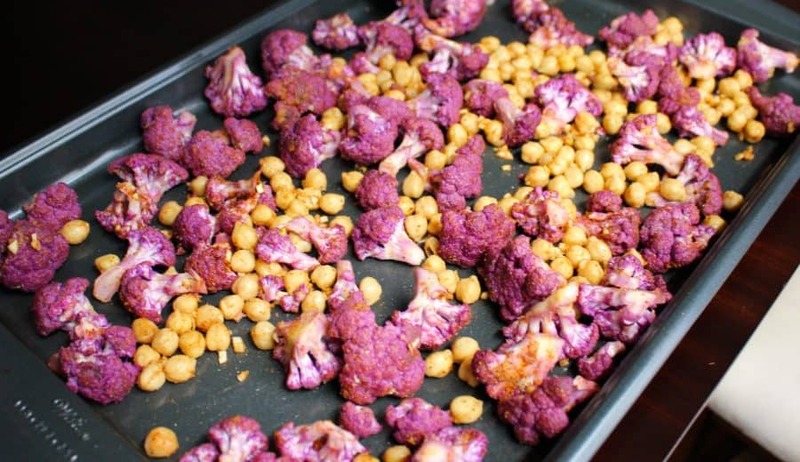 Bake at 350 degrees for 25 minutes or until cauliflower is tender crisp. Get your Quest bars here! I love them for a snack – lots of protein and hardly any sugar. Bake chicken at 350 degrees for 25-30 mins. Directions: Cook turkey in large skillet, add in Emeril’s Cajun seasoning if desired. Steam sugar snap peas in microwave: Place sugar snap peas in a microwave safe bowl. Cover bowl with damp paper towel, microwave for 3 minutes. Cut sweet potato in half lengthwise and brush with olive oil. Sprinkle with garlic powder and seasoning salt if desired. Bake at 350 for 45 minutes, then increase to 400 degrees for another 10-15 minutes until tender. 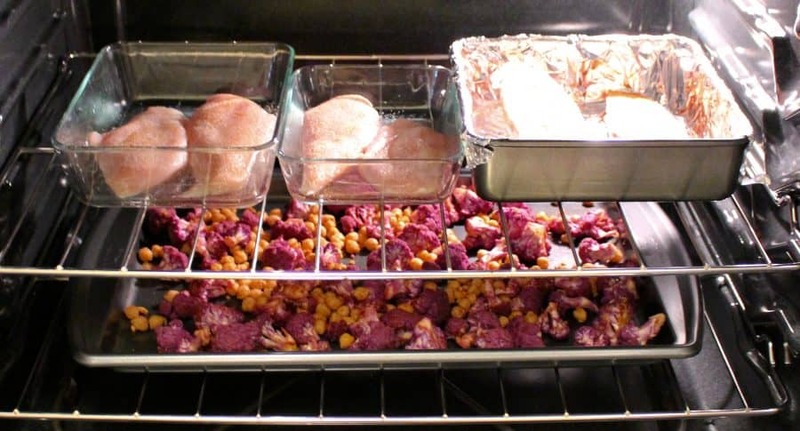 I stuck everything in the oven at one time – helps save time and energy. 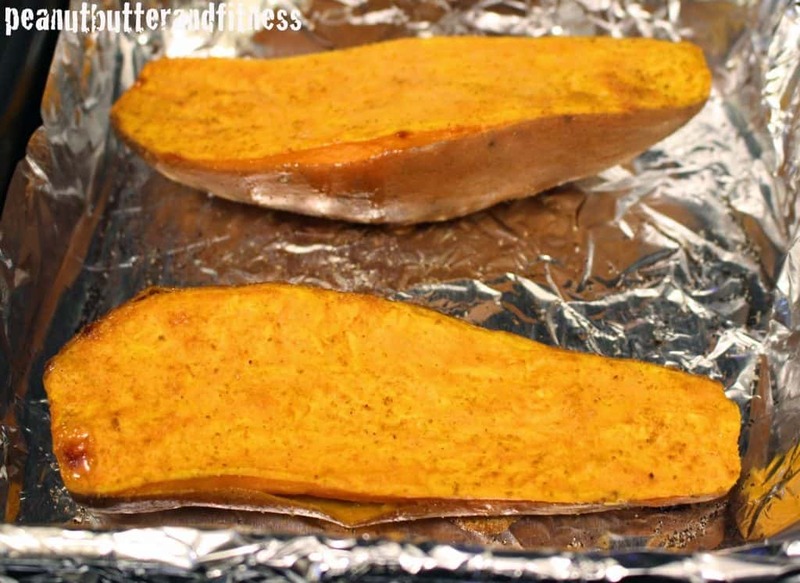 The sweet potatoes kind of look like they’re about to get beamed up thanks to the foil and bright oven lights. The sweet potato got so tender that the skin started to fall off 🙂 Deeeelicious. I love using foil to save me from having to do any cleanup! 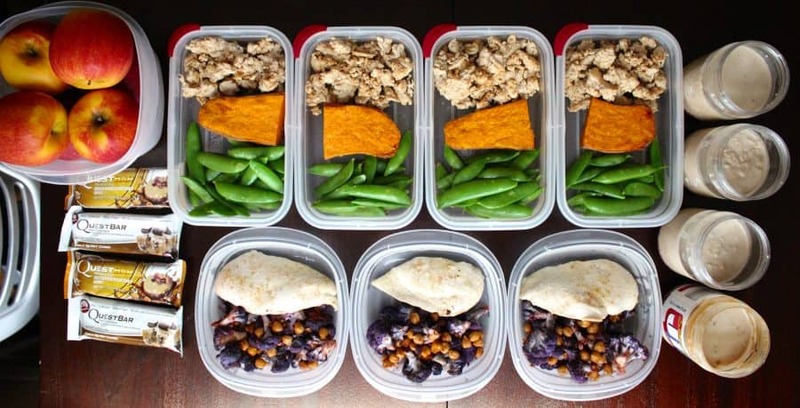 I love seeing new ideas for meal prep! 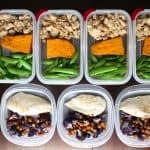 The most appealing idea for meal prep is not having to cook every day! However I cannot seem to figure out how to keep my chicken from drying out. It seems that it's dry just after day 1. Any advice? Soak your chicken in a salt water bath for 1-3 hours, and it will always turn out delicious, and it will re-heat very well. don't fully cook the chicken…cook it until it is almost done. It will retain it's juiciness! Love this post! I see you have shakes, are those protein shakes? would love the recipe for those as well! Thanks! Nope, those aren't shakes, they're PB&J overnight oats.The recipe is linked above. No shakes here! 🙂 Those are overnight oats. Fantastic recipes – I'll be making veggie versions for my packed lunch all this week. Just one question – does the cauliflower recipe keep okay? I was thinking tupperware in the fridge but would that last? The cauliflower kept fine for me for about 4-5 days and I stored it just how you see it pictured above in plastic containers. The meals will freeze well. Please could someone help me out. In what order would you eat these meals. Any help would be appreciated. I'm new to this meal prepping. Hi Gerwyn, what order you eat the meals in is really a personal decision. I usually eat the meals that are higher in complex carbs (the ones with sweet potatoes) right after a workout, which is dinner for me. 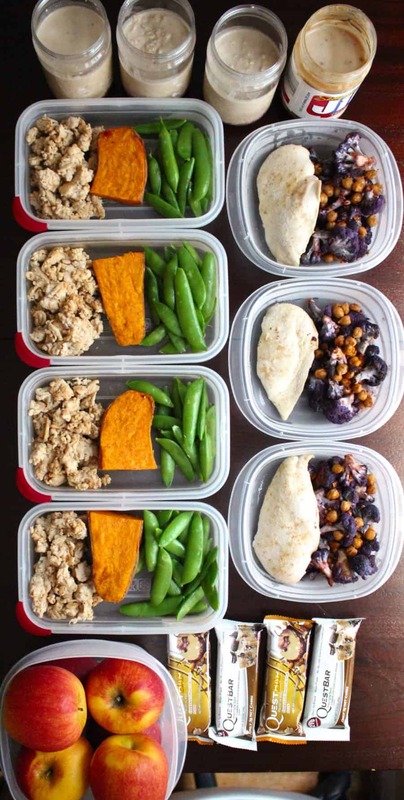 But if you're working out in the morning, you should probably eat the meals with sweet potatoes for lunch. Unless you're an elite athlete or are training really hard, you probably won't notice a difference. If you want to learn more about meal timing, there are lots of articles online written by people who are much smarter than me 🙂 Hope this helps! Thank you so much for providing the recipes! So many meal preps are just a picture and a description! Us newbs, need all the help we can get! I have learn some just right stuff here. Certainly value bookmarking for revisiting. I surprise how so much attempt you place to create such a excellent informative web site.